Site Solutions of Central Florida, Inc. is a Florida Corporation that was founded in 2006. 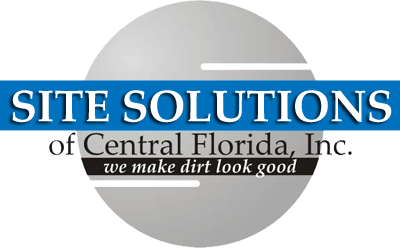 SITE SOLUTIONS of Central Florida, Inc. is a site development company that specializes in providing site work, D.O.T.certified curb work, trench curb, F curb, D curb, sidewalks, parking lots (concrete and asphalt), walkways, concrete slabs and wall systems. As a site developer, we also offer services that include grading, landscaping, irrigation systems and customized projects. Our regular customers particularly value our dedication and superior workmanship. Our expertise includes new construction, renovation and demolition of existing concrete and structures. Retaining wall systems are one of our specialties. As a woman owned company, we are State of Florida Certified Minority Business Enterprise, City of Orlando Certified Minority Women Owned Business Enterprise and Orange County Certified Women Business Enterprise. Our firm is registered as a MWBE in the Orange County, Fl public school vendor list as well as other government entities. You can reach us at 407-578-7452 office phone or 407-342-3767 cell phone and by fax at 407-930-7976. Or contact us via email at info@sitesolutionscfl.com. Site Solutions of Central Florida, Inc. has over 30 years of construction experience. We provide outstanding service and quality workmanship. Please contact us for additional information or questions. We will be glad to assist you in any of your construction needs.